As your business begins to grow, you may find yourself needing an increase in security. Many commercial and military buildings need to be protected; however, if you are constantly expanding, this can become more of an issue. It is important to find a solution that works for your business or industrial needs. Prefabricated security guard houses are a popular choice because they are easy to move and inexpensive to produce. Learn more about why they are a practical addition to your property. One of the biggest keys to the success of any business is a layout that promotes efficiency. The main reason people choose a portable guard house over a traditional building is because it can be easily moved or modified as your needs change. This allows the business to have more flexibility and improve functionality whenever able. 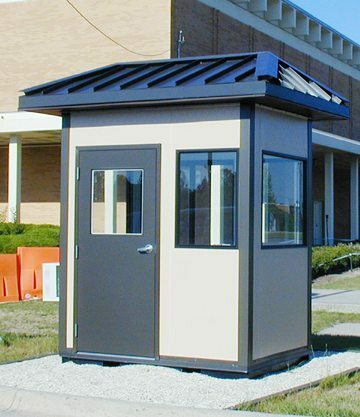 The best guard booth available online will avoid messy construction or hefty moving costs. Companies that sell security booths online understand the importance of manufacturing off-site. This means that instead of building at your location, the guard booth is manufactured in an assembly-line setting by skilled workers. It is then shipped to your location and placed wherever you want. The weight is also kept at a minimum so that you can move the guard houses as you see fit. Full customization options help you get a design that is not only functional, but attractive as well. Panel Built has a variety of materials, including paints, available to help you get the desirable look that you want. One of the biggest benefits of prefabricated security guard houses is the added security they bring. Whether they are being used as check points or as a place to store cameras, a guard shack can easily improve the level of security that you have. A modular guard house has a lot of benefits, so they are a simple way to enhance the security you already have. There are many types of prefabricated guard houses; however, most of them have the same structure. They are typically smaller booths found outside of a parking lot or near the entrance of a restricted area. Designed to house one to three on-duty guards, they are manned 24-hours a day. This helps to protect your merchandise or staff from intruders. One of the growing trends in security is to include larger guard booths on the property as well. These can serve as a gathering place for your security and include a variety of features. You can also add air conditioning, heat or other HVAC features to the guard booth to ensure the comfort of your staff while they work. No matter what the size of your new building is, it will be easy to relocate. This allows you to strategically place the security booth in your most vulnerable areas. Remember, simply having the booth visible can act as a deferent for unwanted activities. A primary concern of business owners is that their building will take too long to produce. Few realize just how much the assembly line process can speed things up. Panel Built is able to create new buildings quickly because they have moved their operations off-site. This gives the experienced builders access to more tools. They do not have to worry about transporting building materials or setting up a hard hat zone. Instead, they are able to get to work right away. The Panel Built security booth company online offers a wide variety of buildings for sale. The modular buildings are all custom made, and many can be produced in just a few days. This makes it much quicker than traditional construction. In fact, some buildings can be ready to go in as little as three days. When the modular guard booth arrives, it is ready to use right away. There is usually no additional set up required, unless your business has special needs, such as electricity or plumbing. The goal is to help you feel more secure as quickly as possible! If you are a commercial business wondering where to buy prefabricated guard houses online, you should visit Panel Built’s website. Panel Built has several examples of security booths, which can help to give you a better idea of what to expect. You will be able to learn more about the features and benefits that each style has to offer. You can feel confident in your purchase when you shop with an experienced manufacturer like Panel Built. With their expertise and careful attention to detail, you can get a high-quality guard house that you can be proud to call your own. Attractive designs that blend in to your existing theming are available to help you achieve a more professional look. Find guard booths available online for sale at Panel Built. You will be surprised by just how much security you can have when you have the right space at your disposal. Contact Panel Built today to learn more about the benefits of their guard houses and how you can get the custom design you need to improve security.